I have just been doing a bit of work on the 47xx which involved taking the superstructure off the chassis so, as promised, I took a few photos with my phone. This is a general view of the chassis from the top. The inside motion bits are visible in red to the right. The long bolt coming up through the cylinders is the front mounting point for the superstructure and doesn't normally have a nut on it - just a temporary measure to prevent the cylinders becoming separated from the frames! At the back of the frames (to the left) I have taken the opportunity to 'capture' the dumbbell-shaped wire cardan shaft. I made a new slotted sleeve fixed to the worm shaft, drilled to take a pin to retain the wire. 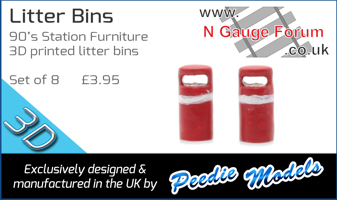 This is a similar view but with the tubular outer sleeve fitted over the slotted inner sleeve to ensure that the wire stays roughly central. 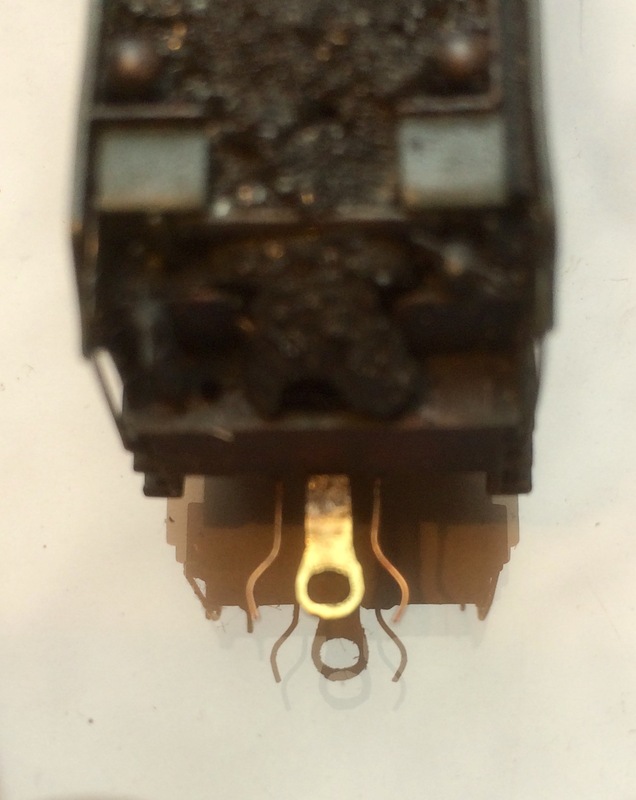 While posting these, I took a quick (rather fuzzy) shot of the tender drawbar arrangement with its slightly oval shaped hole (to give some side-play) and the pair of 'J-shaped' phosphor-bronze wires which make rubbing contact with the inside of the loco frames. Of course, this only works with split-frame construction, where the left and right sides are insulated. 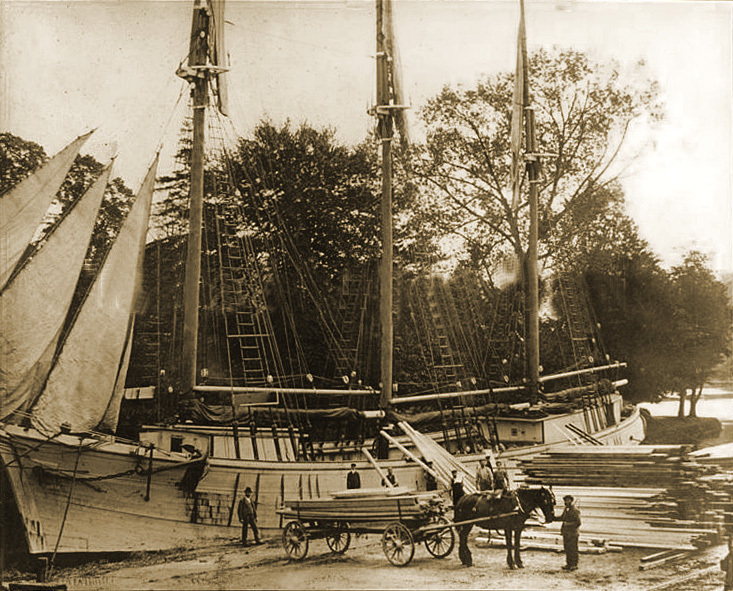 A three-masted topsail schooner with a cargo of Baltic pine planks for Reeves of Totnes in 1925. The ship was built in 1905 at Neptun Werft AG, Rostock, Germany and was registered in Lübeck. She had a displacement of 560 tons and is shown waiting to be warped into a berth at St Peter's Pool Quay. After the Great War, she was seized as reparations but was bought back by her German owner. Her sail plan was revised to reduce crew requirements and she was fitted with an enclosed wheelhouse, an auxiliary diesel engine (ex U-boat) and a donkey engine on the foredeck, driving a hydraulic winch and windlass on the forecastle. 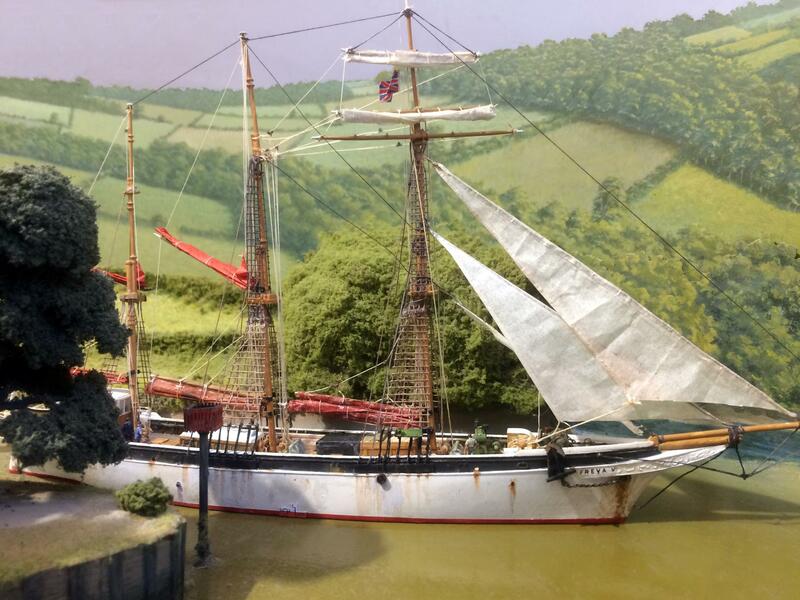 The model started life as a fairly ancient and rudimentary Czech Republic plastic kit of the Cutty Sark, to 1:180 scale. The hull was cut down to the waterline and a couple of transverse slices were taken out to reduce the slender "clipper" shape. Masts were slightly reduced in height and the whole was totally re-rigged, with just two square sails on the foremast and fore-and-aft gaff-rigged sails on the main and mizzen. Sails were made of thin paper, shrouds and rigging were of button thread and sewing cotton. 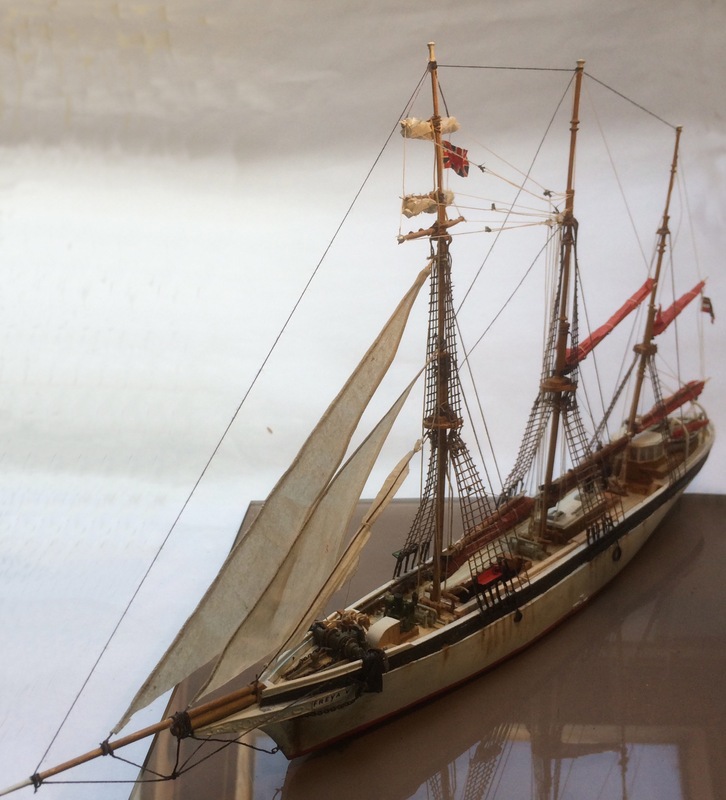 The windlass, donkey engine, wheelhouse and other details were scratch built in plastic card and the hatch covers and deck housings were modified. The model won the Chairman's Trophy at the 2017 2mm Scale Association Annual General Meeting. Photograph of a Russian or Finnish timber ship at Totnes, probably about 1910. My first attempt to post a YouTube link - hope it works! Beautiful stuff - lovely engineering. It shows me just how much of a mountain I have to climb to reach your standard John, Pendon level modelling indeed. "A journey of a thousand miles begins with a single step" and, looking at your website, you have already covered a long way. Keep it up. 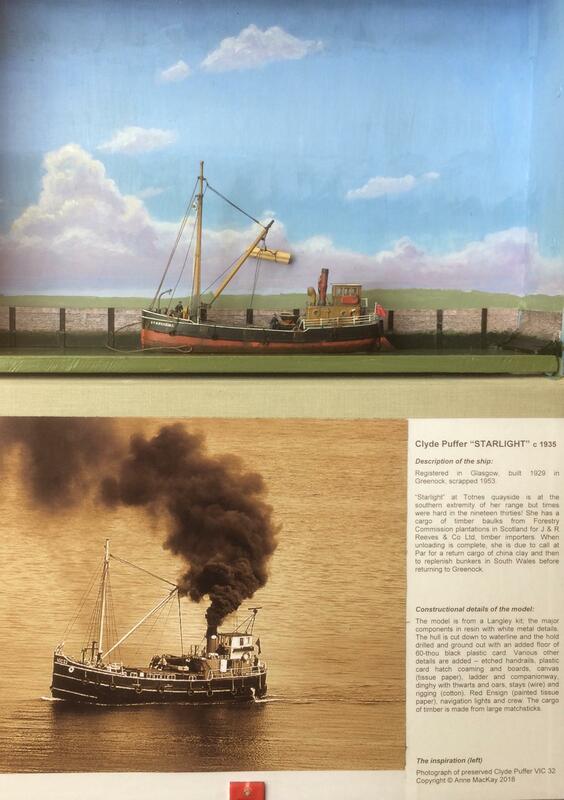 The Clyde Puffer "Starlight" will be travelling to Padstow to be on John Greenwood's brilliant North Cornwall layout at Wells this weekend. Come and see the best concentration of 2mm scale layouts at a single exhibition this year. Ashburton will also be there. I've just read your article on painting back scenes in the latest edition of Model Railway Journal. It is very good and I'll be re-reading it when I'm ready to consider the back scene on Hadley Wood. Thank you for writing it. Thanks for your kind comments. Maybe I should post something on backscene painting in the near future. I have begun a thread on my backscene painting in the "Layout construction - Ashburton and Totnes" thread.